Ready for a brilliant Soccer Fundraising Idea? But one of the BEST fundraisers is through selling team Apparel and supporter Apparel! This could be shirts, scarves, beanies, caps, mugs, stadium seats, shorts, or kit bags etc. 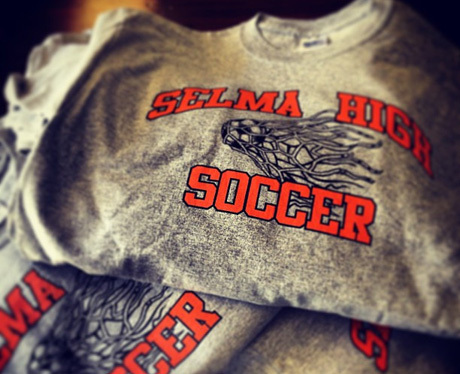 Any type of Apparel that will be suitable for your soccer team or club. I absolutely love this method of fundraising as it provides a few different benefits on top of raising funds for you soccer team or club! 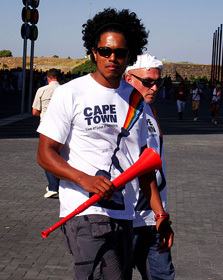 Build spirit and pride amongst your team/club and also amongst your supporters! Provide free promotion of your soccer team or club. Every time someone wears one of your Apparel items they will be broadcasting your logos and motto's to the world! And will help you gain more supporters as awareness is spread of your soccer club through the "promotion" benefits of your Apparel! Now with all that to consider why on earth would you not want to run this soccer fundraising idea?! There are two ways to run this sports Apparel fundraiser and either way may be better suited for your club or team. OR you may want to combine the two! Online, through an Online Apparel Store, or through a T Shirt Crowdfunding Campaign. Or Offline, by selling directly to people. Each method has its own set of benefits, so consider your club, its unique situation, and what the different benefits are of each method, before you decide which one to use. Setting up an Online Sports Fundraising Apparel Store for your soccer team or soccer club is really simple to do. It is also the way I would recommend you run this fundraiser. An Online Apparel Fundraising store is FREE to set up! It's also FREE to run! This means that you don't need to spend the limited funds you already have to hold this fundraiser. The same applies to a Online T Shirt Crowdfunding Fundraiser, which you can find out more about and also setup here. There's also very little hassle to running it! You don't have to worry about taking orders or taking payments. You also don't have to worry about printing the Apparel, or worry about the delivery (or shipping) of it. And then promote your Soccer team's store, and drive your supporters/customers to it. You will then earn 20% of every Apparel Item sold! For clothing and Apparel fundraising that is a very good profit margin! Firstly read the Online Apparel Fundraising page to make sure you get the most out of your store. Then setup your Apparel Store here with SSA or setup your T Shirt Crowdfunder here. Unfortunately SSA is currently only available in the USA but will be expanding worldwide quite soon. I would also suggest that you be your best supporter and promoter, and make sure that you use and wear your soccer teams Apparel. If you can afford it, is to order a few samples for people to look at and touch when you are promoting your store and your soccer clubs Apparel! ...of running this soccer fundraising idea in this way, is that it costs you funds to print all your Apparel (To buy your stock). A way around this of course is to get a business to sponsor the printing costs, which will allow them advertising space on all your Apparel. ...of running it this way is that you will obviously have the Apparel in stock and your supporters can touch it, try it on, buy it right there, and take it with them immediately. And don't need to wait for it to be delivered! You can then also sell all your different team and supporter Apparel at events and at your soccer matches! Then either immediately, if you can afford it, or once you have raised enough funds to be able to afford it, start ordering Apparel yourself off your Online Store to keep as stock and to sell directly to people! Remember that SSA offer a discounted Bulk ordering feature to help groups with doing this! But you will also get the benefit of being able to sell to supporters directly on the spot, or at your soccer club or soccer matches! You can read both the Online Apparel Fundraising page and the Apparel Fundraising page to get tips on designing your Apparel and promoting it. First of all make sure that your Apparel is 'cool' or desirable. The great thing about an Online Store through SSA is that all the Apparel available is excellent quality and there are some really great styles. 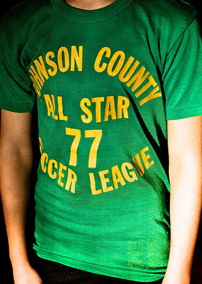 The bottom line is that you want all your supporters to really want to wear your Soccer Club's Apparel. It must be so cool that your opposition also wants to buy it!!! From a promotional side, understand that every single fundraiser you ever run will only be successful if you promote and advertise it effectively! So make sure you use all of your online media to promote it properly. Like through your Facebook page, your website, your newsletters, on Twitter and any other online media you use! Also promote this soccer fundraising idea through word of mouth, and use posters and flyers to grab people's attention. For an online store you should send out a press release for its launch, both to local newspapers and radio stations, plus through online press release sites. For more promotional ideas for this Soccer Fundraising Idea read here. This Soccer Fundraising Idea will be extremely successful if you can do these two steps right, so make sure you do them effectively! Good luck for your Soccer Team Fundraiser! Then head over to SSA Stores and start setting up your FREE online Apparel Fundraising Store. Remember to be creative with your designs and logos!